Suburbs Mama: Nicholas is 7 months old! 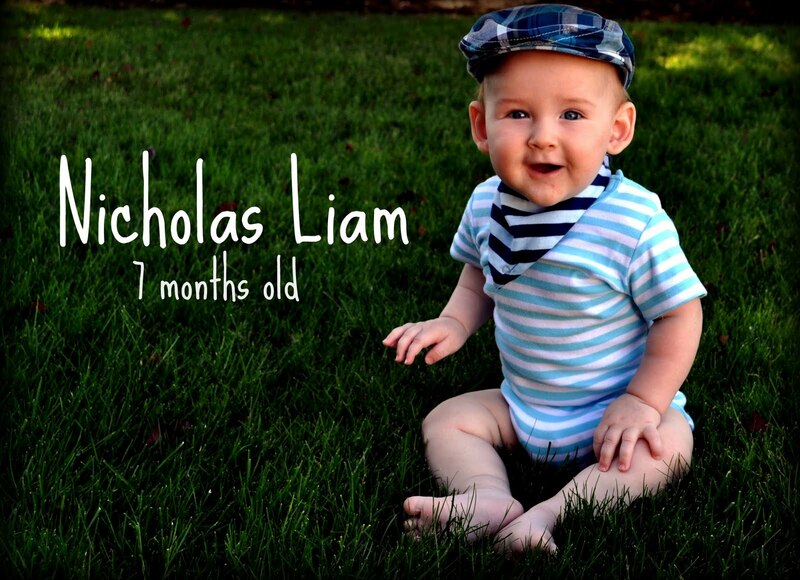 Nicholas is 7 months old! I can not believe my little baby is 7 months old! I took him to his check up last week, He is already 22 pounds and 29 inches long. He is a chunky boy, he wears size 12-18 months now. I am still breast feeding and co-sleeping with him. We are still using only cloth diapers. I have started giving him some solids (pureed veggies and fruits) He loves it, although I never give him more then 2 oz at a time. Nicholas did have a issue with a skin reaction because I changed baby shampoos. I stopped using Johnson & Johnson's baby shampoo since I heard about the lawsuit. We switched to Peter Rabbit Organic baby shampoo/wash, sold by whole foods. However, Nicholas started getting red bumps all over. So we switched to Aveeno, which is going great. No more bumps. Nicholas is not actually crawling on his hands and knees. He is, however crawling on his tummy, he uses his arms to pull himself forward. He doesn't like his jumper very much, I think he does't like it since it constricts him to one area. He would rather be rolling and crawling around on the floor. He loves attention, and when some one starts talking to him, he tilts his head sideways, crinkles his little nose and screeches. So cute, you have to see it! Nicholas is going to see his grandma, grandpa soon. I am just so nervous on flying alone with two kids. Augh, my stomach ties up in knots when I think about it. They look innocent, enough.. huh? Both your children are just adorable! Savor every minute with them, as the years go by so quickly. A couple of days ago, I dropped off my oldest at college orientation, and for me it was worse than her first day of kindergarten. lol! If I could, I would go back and have her little again! Good luck on your trip! Happy 7 months, he is the cutest!! Winner of Nine by Thirteen Giveaway! !